On April 20th 2017 the Ontario government introduced their Fair Housing Plan which included a 15% tax on homes purchased by foreign (non-resident) buyers. The provincial government introduced the tax as a way to cool the Greater Toronto Area’s real estate market which had seen prices appreciate by 33% the month earlier. The theory underpinning this policy decision was that international buyers were using a significant amount of foreign capital to speculate in our residential real estate market which pushed prices up to unsustainable levels. Did the policy work? 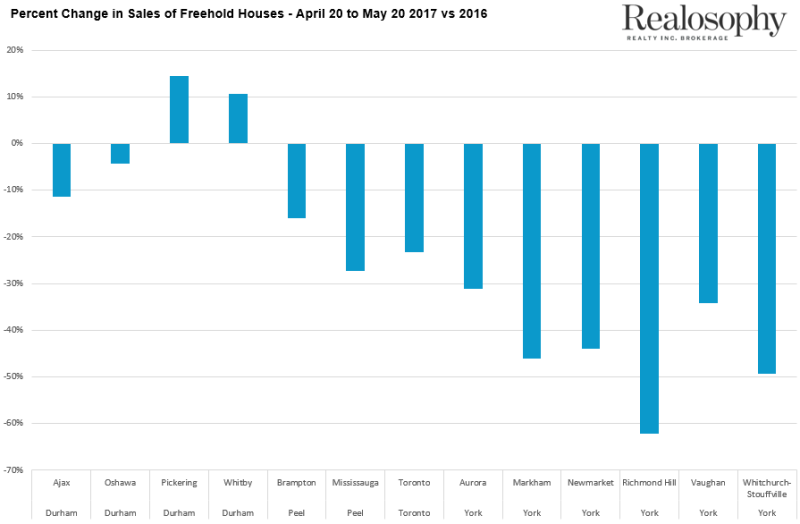 Since the tax was introduced on April 20th we have seen the number of sales of freehold houses in the GTA fall 26% during the one month following the introduction of the tax (April 20 – May 20, 2017 vs 2016). But when we dig further, we see that not all municipalities have had the same rate of decline in sales. The chart below compares the change in the number of sales by municipality. Sales in Durham region were flat overall with Ajax and Oshawa seeing sales fall while Whitby and Pickering were the only municipalities in the entire GTA with an increase in sales. Sales in Toronto were down 23% over last year but the biggest declines were seen in York Region. Richmond Hill saw a 61% decline in sales in the one month following the tax. Whitchurch-Stouffville saw the second highest drop in sales at 49% followed by Markham at 46% and Newmarket at 44%. But is the entire decline in sales the result of the province’s foreign buyer tax? Firstly, we’ll never really know because unlike the BC government the province of Ontario decided to introduce the tax before collecting any data on how many homes were being purchased by non-resident buyers before the tax. They have started collecting this data since April 20th, but we’ll never know how many homes were purchased by non-residents before April 20th. Now the astute observer might point out that the bulk of the decline in sales was seen in areas popular with buyers from mainland China – which also happens to be the main region that most believe is the source of the majority of the foreign capital flowing into our real estate market. While it’s certainly possible that the tax had some impact on sales – I’m not convinced that it’s responsible for the decline we are seeing. I believe the big declines we are seeing in York Region are in part driven by a big decline in demand from investors. In March I wrote a report titled Freeholds On Fire which looked at the percentage of homes being purchased by investors. I did this by calculating how many buyers listed their home for lease on the MLS shortly after taking possession. The chart below shows the % of homes purchased by investors in 2012 vs 2016 by municipality. 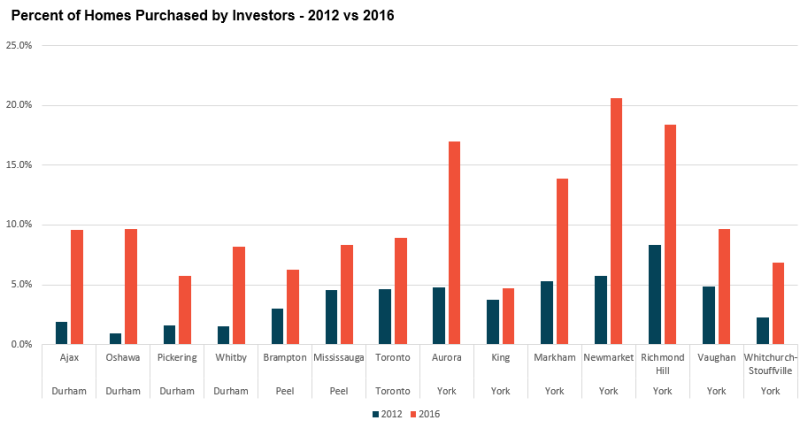 Newmarket, Richmond Hill and Markham were among the most in demand municipalities by investors with 21% of Newmarket homes, 18% of Richmond Hill homes and 14% of Markham homes selling to investors. 95% of these investors were buying homes that were losing money each month because the rent wasn’t high enough to cover the carrying costs of the home – but did so because they believed prices would just keep going up by 20% per year. This type of speculative behaviour has virtually disappeared over the last 45 days. Buyers are starting to see for the first time in a long time – that real estate prices can actually go down. When prices climbed 33% in March 2017- this may have been the straw that broke the home buyer’s back. Buying a home in the GTA was already difficult in 2016, but somehow the average cost of a home went from $688K in March 2016 to $917K in March 2017. This last surge in prices was too much and too fast for most buyers. After seeing some of the incredibly high sale prices in February and March – many buyers decided to get out of the market because they felt they just couldn’t compete. There was also increased fear that this market really was a bubble ready to pop. 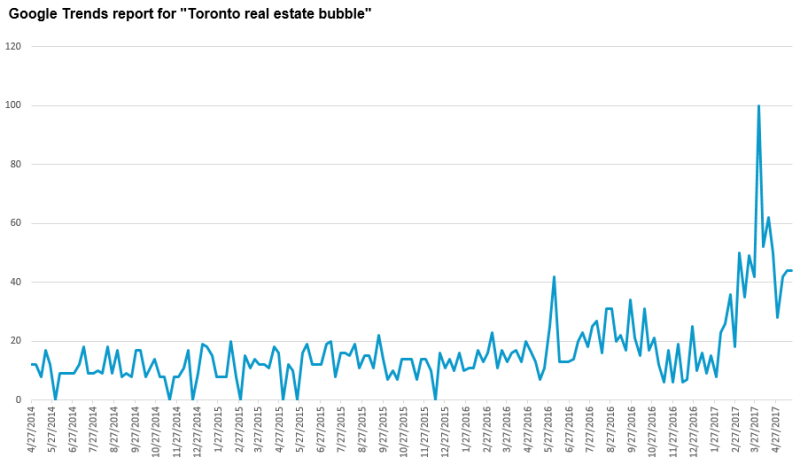 You can see this in google search results for “Toronto real estate bubble”. We saw the first big increase in people searching this during the first week of March, when the Toronto Real Estate Board (TREB) announced that prices in February were up 28% over last year. Then we can see the search peak during the first week of April when TREB announced that prices were up 33% year over year. It looks like the road ahead for Toronto's real estate market is going to be a bumpy one - at least for the next 3-6 months. As unfortunate as it might be for some, this cool down came at the right time. If our market had continued to appreciate at a rate of 30% per year for another year or two, the end result would have been even worse. I'm not convinced that our market is going to see the 20-30% decline the real estate pessimists have been waiting for. In the short term prices shouldn't appreciate by much at all, and might even drop slightly. But I believe this cool down will eventually bring us back to the more balanced (but still competitive) market we were used to 3-4 years ago when prices were appreciating by 5-7% per year.